Treatment of rib injuries varies depending on the diagnosis and severity of the condition, and whether the condition is acute or chronic. Acute rib injuries respond well to ice and anti-inflammatories combined with physiotherapy treatment. Physiotherapy treatment involves mobilisations, contract/relax resisted muscle activity, and taping. Ice is usually the most relieving home treatment combined with gentle muscle and joint exercises as prescribed by the physiotherapist. Chronic rib injuries also respond very well to joint mobilisations or manipulations. 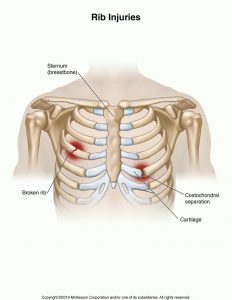 Chronic rib injuries may indicate that there is an underlying biomechanical dysfunction of the thoracic region. Treatment in these cases will also involve addressing the biomechanical imbalances (usually restricted joint ranges and muscle weakness) related to the rib injury. However, the lumbo-thoracic junction (usually too much movement) and the cervico-thoracic junction (usually too stiff) are also areas that can be prone to developing rib problems above or below the region.